An old friend who is a serious comic book collector flattered me recently by likening me to the character Oracle. For those of you, like me, who aren’t intimately familiar with the DC universe, Oracle is the nom de guerre of Barbara Gordon, librarian, Commissioner Gordon’s daughter, and the former Batgirl. I will pardon if you haven’t quite seen the likeness yet. And I promise I have a reason besides my own vanity for relating this. As Commissioner Gordon’s daughter, she is shot through the spinal cord by the Joker. 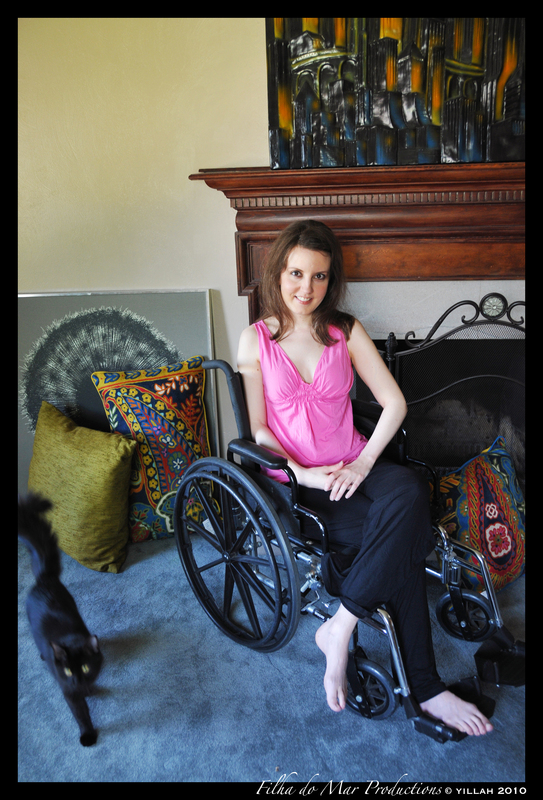 Paralyzed from the waist down, she is relegated to a wheelchair, and retreats from her crime-fighting past. Eventually, though, in response to her straitened physical circumstances, she emerges from the shell the wounding has put her in and turns her prodigious intellect, remarkable memory, research abilities, and knowledge of computers to a new role as an information broker, backing Batman, Nightwing (the former Robin), and the Birds of Prey and helping them succeed in fighting crime from behind the scenes. While I feel like I’ve lost a fair number of IQ points and I’m not the hacker that Oracle is portrayed as, I do have pretty good Google-fu, a detail orientation, a gift for finding connections, a severely overdeveloped sense of justice, and a whole heck of a lot of time on my hands, being mostly bedridden. And as my energy level has improved a little in the last year, I’ve had the opportunity to help the above-mentioned friend with some computer- and web-based tasks, and that’s led me to take on some other low-stress outside projects. Not for Batman. At least not yet. Sorry. Next year will be my high school graduating class’s mumbly-mumpth reunion. Earlier in the summer, our class president re-activated a facebook group for us, and I asked him if I could help us start to prepare by looking people up on facebook. Barring a miracle, I won’t be able to go, of course, but I thought it would be nice to feel as if I contributed to helping others to enjoy the event. Theatre & visual art folk at the last reunion. That’s me on the right. It’s sort of weird to me at this point to see pictures of myself well and standing up. You can’t buy irony like that. Anyway, I’d done something like this previously, looking 120 people up for my high school theatre’s facebook page, and it wasn’t difficult – a bit tedious, but it is fun to see what people have done with their lives. Okay, yes, it’s also fun because I’m a total creeper. So that’s what I’ve been spending a chunk of my time doing of late, kicking up the old tendinitis in my hands in the process, which has kept me away from writing here. One of the things that’s hardest about being this sick is how utterly useless it makes you feel, so I love that I’m actually accomplishing something useful – something more than posting weird links and cat videos to my old friends on facebook. I knew off the top of my head how big my graduating class was – 580+ people (I went to what was at the time the second-largest secondary school in Virginia). When I started typing the names into the spreadsheet from the yearbook, I figured it was going to be a big task, but I guess I didn’t figure on the difference in importance I’d internalize between looking up people to invite to a facebook page that there’s no real deadline on and the higher-stakes game of tracking people down for A Big Reunion. And this task is a little tougher, because I have fewer mutual friends to help things along than I did with the theatre crowd. Looking at profile after profile has been interesting – and has made me feel unexpectedly wistful. I’m not the kind of person for whom high school was the high point of my life, but because I was well then and I’m sick now, I think I probably look back on it with more nostalgia than I used to. It’s easier now to look past how much I resented the regimentation we were forced into and the depression I suffered at the time and just remember all the things my former vitality made possible. And there is something about the fact that these are the people with whom our topics of conversation and shared experiences were the milestones of adolescence, what were to that point big events in our lives: our crazy driver’s ed road instructors, how long until the date we could get our licenses, how many times to take the SATs, if and where we’d managed to land summer jobs, surviving AP classes, pulling our hair out over college applications, anticipating prom, and the great launching and subsequent diaspora that was graduation. The guy voted “Most Likely to Succeed” indeed has his own law practice. “Most Eccentric” no longer has green hair and also works in law. “Prettiest Eyes” is a newscaster, and in Googling her I discovered that there are whole websites devoted to saying offensive and degrading things about female newscasters, worse than you’d ever hear whispered behind the cover of a locker door. Never let it be said that creeping never taught anyone anything. Yes, I know I’m getting a biased sample – people are probably not going to crow about their non-accomplishments, unhappy relationships, and mid-life crises on facebook, but it’s a cross-section of my peers, and for me personally, one of the things that that is another reminder of a couple kinds of life progress that the disease slowed and then totally stymied. September always makes me feel a little wistful anyhow, because it’s been a transition point in my life so many times. This is just amplifying it. But let’s not dwell on all that too long, right? I have crime to fight a spreadsheet to finish. This entry was posted in Life Before, ME/CFS and tagged career, creeping, nostalgia, Oracle, reunion, school, secret identity. Bookmark the permalink. Thanks, DoD with DoD experience. Interesting timing for me. I used to be a highly productive jewelry designer, but over the past few years my hand tremors have gotten worse and worse. It used to come and go, but now it’s pretty constant, like I’ve been drinking pots of espresso. I’ve cut out all coffee, tea and even my Adderall, but still no help. Oh, Grace, that’s gotta be a heartbreaker – losing something so necessarily specific to a favored ability. I’m just a general-purpose physical failure. Have you tried out any voice-recognition software to help cut down on the typing frustration? I know it’s one of those computing problems that it’s seemed like has been just about to be mastered for at least the last 15 years or so, but maybe it’d be worth a try? I’ve also been feeling a little wistful and worried about the future – I think it’s the whole new academic year thing. Exactly, IE. If I can’t do the things that used to give my life purpose in the ways I used to do them, maybe I can find other things that will. I’m so glad that you are able to participate in a way without feeling jealous of those that can go to the actual event. I have to say, I am the same as you as I enjoy looking on facebook to see what people are up to – am thinking about it even more right now as I have just been to a reunion of a trip I took while in high school. Tamara, I’m just so glad I can contribute in any tiny way. And facebook is basically one long reunion anyway, without the travel expenses – my good friends are there, and I’ve developed some friendships with people I only peripherally knew at the time, which is really nice. So that’s what happened to Batgirl. Your post is inspirational. I hope your crime-fighting days are just beginning. Great story and writing! Thank you for posting this! Thanks, macrossguitarist, and thanks for dropping by! If you have hand tremors please check them out and because *I think* hand tremors are not part of M.E or CFIDS at all. It might be a completely different thing, separate to M.E or CFS. Rachel, they’re not common, but I do know some ME/CFS patients have them. Linda Crowhurst comes to mind. But yes, it’s definitely worth having them investigated if they haven’t been, just to be sure it’s not something else. ¡Hola Princesa! Estoy leyendo: Grandes Esperanzas por Charles Dickens. Eres una Chica con mucha fortaleza y me gusta tu estilo de escritura. 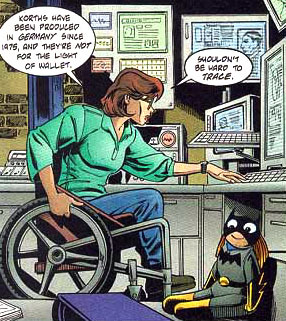 I’m a huge comic fan with a very referential mind, so every time I see a pretty brunette in a wheel chair I think Oracle/Barbara Gordon. No joke, I saw your picture on the right-hand side of the screen and thought of the former Bat Girl immediately. Then I saw that your post referenced her. Being compared to Barbara Gordon in any way is always a compliment. It’s always interesting to see where your classmates end up. I haven’t been out of school for a crazy long amount of time or anything but I’ve seen people change/grow/become complacent so much. It’s always interesting to see who people become. Barbara is awesome! Though I have to admit, my main exposure to the Batman universe was my love of the totally campy 60s series, and Julie Newmar was far and away my favorite part of it. I love that particular era’s clothes, and I think I have watching too much Batman & The Monkees to blame. I still have several of the same close friends from the high school era, and I think they’ve just become themselves but more so. I can see how a lot of things they were then have carried forward. Thanks for coming by and saying hello, theyellowranger! 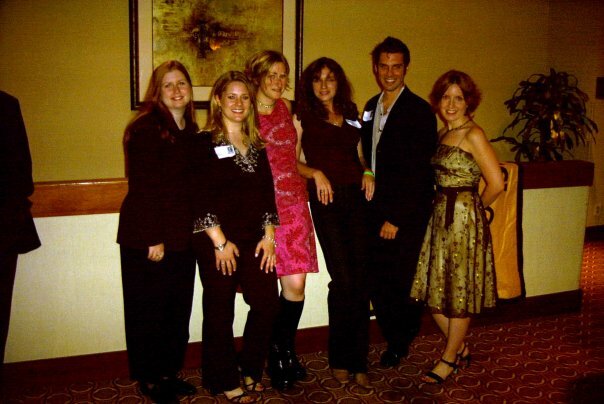 I’ve only gone to one reunion…the 10th year one…with a girl who is now married to someone else, has three grown-up kids and gave me a two-weeks’ notice before breaking off the engagement. Have been married to one woman for 23 years, this past June 3rd (We celebrate or at least mention it every 3rd of the month.) Have kept up with a handfull of my High School classmates….but being dinged by CLASSMATES.COM everytime I visited on there kind of soured it for me. I went my own way doing my own thing…not too much in common except I still write poetry. Come see some at the blog I share: at ourpoetrycorner.wordpress.com. And by the way, it is nice someone identifies you with a cartoon character…she’s almost as cute as you look:7)—! Great post, and congratulations on being on Freshly Pressed! I’m only entering my sixth year out of high school, and I think I still feel much like you do. But while I can’t help creeping a bit, or feeling smug about certain people and jealous of others, I prefer not to if I can exert some self control. Like you, I get generally wistful this time of year, and I’ve also noticed that hanging out with all but a couple people from my high school (my graduating class had only 44 people, so I think we’re all still sick of each other) seems to make me revert back to my 16-year-old self, and without meaning to or being conscious of it, I get angsty and bitter and mean, and I can just feel myself crawling back into my old self, and I hate it. I don’t know if my school even has official reunions, but I might prefer to help organize it and then watch from the safety of my computer, like you. That’s not hard to understand at all, mclicious. We get used to interacting with certain people in certain ways – like having an old friend we can be out of touch with and just fall in together with like no time has passed. That’s the *good* side of it…but you’re right, sometimes we don’t like the people we turn into when we fall back into those grooves. woah! i really love this post! very interesting! thank you for sharing! Sorry to hear about your not-so-good condition fo the timebeing (I assume). Nonetheless, this blog post made me look back at the good old days really makes me nostalgic. It’s something I don’t usually like but for some reason I did like it. Your story just prompted me. The bottom line is, you wrote so well that I just wanted to congratulate you on being Freshly Pressed. Congratulations! Well deserved!!! Thanks for the sympathy, Sony, and for the congratulations as well – I appreciate you dropping by! Great post, really enjoyed reading it, thanks for sharing! Thanks for coming by to read, SP! Great post, well-written, as always. And, obviously, your crime fighting days are still ahead of you. There are lots of things to do via the Internet. My comment on all this is it’s better to be homebound with a computer, reading wonderful blogs like this one, learning and communicating, than it was in the pre-computer days. I have to forego a lot of the higher-tech communication methods like Facebook, Twitter, Tumblr, etc. It’s just overwhelming and too much work! Friends keep trying to get me on Facebook and don’t understand why I consider it work and an assignment. You’re doing great! And I have to say I love that photo with you in the stunning dress. Thanks for the pin, Grace! Very kind of you. Thanks for the kind words! Well, as far as names in the superhero universe that I could apply to myself, Catwoman would probably be the most appropriate. I have a major thing for those little purr machines. But I try not to be evil, at least most of the time. Thank you for coming by and for the congrats, followechoes. Thanks for the reblog, drndark! I was in a bad mood when I started reading this but by the end of it, I was already in smiles. I like the upbeat tone of your post despite facing such challenges. May God keep your smile shining and keep you strong too. Thanks for letting us in. So glad I could brighten your day a little, Lonely Soul. Thank you for visiting. Very kind of you to say, bpr! Much appreciated. Exceptional woman and exceptional story. All should read! Many thanks for the reblog and the kind words, misslizgooden! wow – you make me want to creep facebook in a whole new way – mostly I spy on kids – it might be far more interesting to ‘peer’ into the lives of my peers. You’re a wonderful writer. I’ve been blogging about my empty nest, so much emptier at this wistful time of year. Ha! I think there’s a real human curiosity that facebook makes it easier than ever to satisfy. Hope you discover many interesting things in the process. Thanks for visiting, tm,lm. Fantastic post! I went to a super small school, so when my reunion comes around it will be a lot different, I’m sure. But just the same, I’ll be curious to see the lives of our “superlatives”! Much appreciated, Katherine! One thing this has definitely driven home for me is that there were plenty of people who didn’t get tons of recognition in high school who have gone on to enormous achievements. ASW, there’s always the possibility she’s out there thinking about connecting with you…hope you find what you’re looking for. Really I’d just like to apologize. Welcome and thank you for taking the time to read, Matt. I appreciate the offer of help. I’m actually a patient of Dr. Paul Cheney, who has been treating the illness since it emerged around him and his practice partner in Incline Village, NV in the mid-80s. He is an absolute genius (he got a PhD in physics before deciding to go to med school!) and is constantly evaluating and revising his protocol in response to patient reactions. He has helped me get some small but substantial improvement over the past three years – for the five before that, I’d been going steadily downhill. Some of what I take from him is supplements, but he also uses pharmaceuticals whenever necessary – he is not doctrinaire. Here’s a look at my protocol from last year. This is fantastic and I love Oracle. 🙂 We could use more strong female comic characters like her making it into the mainstream. Agreed! She has really been a godsend to the community of people with disabilities, as I understand it. Thanks for dropping by and for the blessings, Connie. The term “Google-fu” made my day, I must say. I really enjoyed your post and thank you for sharing with us. I try to think that there are no “bad things” but only things that happen to us. It’s easier sometimes more than others. But the truth of that theory is that some things can’t be changed and the only real control we have over our lives is our disposition throughout. Based on this post, I can tell the pain is there but you really manage to try to look on the bright side. You’re funny, thoughtful, and productive. Good luck getting your reunion together, that sounds like a tall order! I wish you all the best in the future; specifically I’d hope you could find a way to attend this reunion. It sounds like you’d be a presence that would be greatly missed there. I can’t claim credit for Google-fu, but I love it as an expression too. As for the rest of your comment, it’s the absolute truth, madhaus7. I have it pretty bad healthwise, but on the upside, I have a happy marriage, a wonderful family and many friends, a roof over my head, enough extra money to see a specialist in my condition who has helped me get some small but genuine improvement (enough to write this blog! ), and the whole wide internet to keep me busy, informed, and learning every day. Would I rather be healthy? Of course I would. But I didn’t get a choice in that, and letting it go and valuing the many things I have that others wish for is to be happy. You sound like you have your thoughts on the important things and I’m happy to hear so. I wish you continued success and improvement. Thanks for replying! Congratulations on being freshly pressed. Keep writing! I just finished reading “The Science of Mind,” by Ernest Holmes. I think you might find it helpful and inspiring. The power of the mind to heal is truly amazing. Thanks, David! I’ll put it on my list to check out. Also its funny how too many of us these days are deprived of vitality these days, some through physical means and some through mental means, hope and the sense of having all the time in the world are quickly extinguished in this world, till we have a pill that keeps us living longer and looking younger we wont feel like we have all the time in the world to become a sucess. Also on another of my blogs I am going to be writting a piece about how the internet used to be a way to “expand” your horizons, make connections with people across the globe, expand and make virtual friends and how facebook et all have turned it into a way of insulating you from other culutres beyond your local town or workplace or street or learning establishment. I am not sure that is what the web was envisioned of becoming in 2000, much like humanity itself the web was far happier and content when it was a 12 year old child! Then puberty came and took it all away, it had to find relevane to companies, had to find relevance to every person rather than just existing. I can see how the internet has narrowed down in certain ways, but as a sick person, it’s an absolute godsend in the opposite direction. I know so many, so so many sick people – we connect because we have a huge piece of identity that is tough for others to understand, and it basically turns the internet into a worldwide support group. And I couldn’t even begin to put a value on something like that for people like us who are often homebound or bedridden – we can keep up-to-date on research and treatment with very little effort. It gives us a lot of benefit. Think of your contributions to those of us with ME/CFS, your fellow and sister sufferers. You contribute to our lives with your wonderful blog and facebook page — and your sense of humor! Thanks as always for the encouragement, Kathy! An outstanding post. The people I went to school with are reclusive. Web searches, Facebook and random name searches have produced little. Great, I’m the only one looking for them. Hey, they avoided me in high school. Nothing’s changed, oh yeah, I’ve got a blog and the people who I run into are a lot nicer. Interesting. I found that at our last reunion, fewer cliques seemed to be in effect. It was nice to chat with some people whom I think we mutually didn’t give each other the time of day in high school. Oh yeah, you rock. Checked all the tabs and will follow. Thanks for the reblog, GP! I really loved reading this post, very clever – the super-hero correlation:) Awesome of you to offer to help find your old classmates in order to get the word out on the reunion. You are strong, and a definite go-getter…inspiring! Thank you, BWS. I know so many sick people, and they all channel their previous identities into their new life in different ways – it’s like shutting off the flow of water one place – it has to come out another. So this is an example of a bit of my native stubbornness coming out – that and how I have always wanted so much to do something that makes the world a little better. If I knew Most Likely to Succeed or Prettiest Eyes from my school were reunion-bound, I’d avoid them. TJ, I can’t tell from her profile. But if lawyers had theme music for their courtroom entrance, I’d hope she’d still be rocking out to Skinny Puppy and Gwar. Thanks, lcb! I can imagine how this could be communicated in that genre as well – it’d be perfect for the concept of turning the superhero identity on its head a little bit. Wish I could draw! There are so many great comics out there on the web. i’m looking to discover more comics. i read fun home, ice haven, maus, batman, etc in university. any recommendations? p.s congrats on being Freshly Pressed! Thanks for the visit, the follow, and the congrats, 2cg! I have to admit I definitely had a bit of help from my friend and from Wikipedia there. Thank you very much for the reblog, alterego! i can relate so much with your post so thank you! Yes, those little purr machines are something else. Wish I could adopt some kittens, but I became allergic to cats years ago, after having them in various households for years. I ask for anecdotes from family members with kittens; now I’m pushing for more photos and videos of them running, leaping, jumping backwards with their tails fluffed up. You know. Do you do YouTube? You should totally subscribe to Maru’s channel. Thanks for the reblog, evautaricl! When I need a fix of kittens or puppies (especially Dachshunds, as my neighbor has one I adore), I go to You Tube and look at videos of them playing. Loved it! Plus I learned some more about DC Comics (I’m a European Comic Book Collector). I just watched Maru’s channel. That cat is adorable. Thanks for the suggestion. Oh, good! Yeah, Maru is the best. Do you or does anyone know about feeling faint? I had this problem all summer whenever I stood up at home, would then grab a wall and then sit down again. I was over this. Then today I went out, took a taxi, walked a few blocks, sat on someone’s sofa. Then when I stood up, I thought I’d faint, sat back down again. It could be due to the breathing problems caused by bad allergies or not. Maybe I get dehydrated easily. I don’t know. Any ideas? Kathy, as I think I said previously, I think this is probably due to your heart not getting enough blood to where it needs to be. I know I feel faint if I stay standing up too long. I hear you. I have trouble standing for a long time, which is why I can’t take buses in my city, as the waiting time is too long for me. But for the last 3-4 months, I feel like I’ll faint when I stand up from my bed or couch. I have to grab onto a wall or door frame, then sit down and get up again. Another question is arising for me, or has for quite awhile and I wonder how others with ME/CFS deal with this and it’s more serious the older we get. How does anyone take care of routine medical and dental care: Mammograms, colonoscopies, eye exams, bone density scans, dental check-ups and treatment. I haven’t been able to follow up on much of this for a long time and I wonder how others do this. I’ve scheduled mammograms twice and had to cancel as I knew I didn’t have the stamina to deal with them and stand for 10-15 minutes. Up to a few years ago I did this regularly, but haven’t been able to do so and am asking how others deal with these necessary tests. Jocelyn, I want to agree 100% with what you said. I don’t have a state photo I.D. either, as I can’t travel around the city, stand on lines and exert the energy needed to get one. But in my state one isn’t needed to vote, but who knows what will happen? I’m going to email your letter to a friend in Philly who is following the voter I.D. issue, writing on it, participating in protests about it. Your letter is so good it should be seen by others.